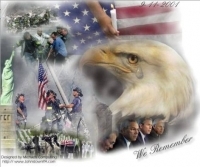 Remembering one horrific day in the USA. | A.B.E. Remodeling, INC. There are no complex words to decribe the horrific actions that took place on our free land back in 2001. We all remember with respect those loved ones, relatives and friends that lost their lives on that day by terriorists who planned on killing Americans . It is a day that most of us can recall exactly where we were and what we were doing when the unbelievable news was heard. What a terrible shadow of darkness from the acts of that day reflect on this beautiful rememberance day. That day 16 years ago was just as beautiful with the sunny and blue skies. And then the darkness of evil fell upon the day. After the news was heard all around, Americas rallied together in support of our great Nation. U.S. Flags were seen everyone supportint our country. People were kinder to one another knowing what had happened. Where did that American spirit go to now with all the fightings in the streets and disrepect that some people show. In honor of those who no longer have a chance to enjoy life, to be kind to one another - Let's be more respectful to others we meet along our journey's. Today, however, we pause to remember the sadness of 9-11-2001. Enjoy your day to the fullest-we just never know.